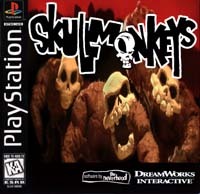 SkullMonkeys is the Neverhood's lastest creation for DreamWork's and the Sony Playstation. It is a super fast paced, action-packed, edge of your seat, jump-n-bump, super weapon, special effects filled, side scrolling klaymationized platform game. And it's funny too! SkullMonkeys is a continuation of the story of the Neverhood. All your old pals are here, including Willie and Klaymen, along with a whole passle of new ones. In this game you once again take on the role of the hero, Klaymen, as you attempt to foil the plans of the diabolical Klogg. It's lots of klay filled fun, with tons of wacky enemies, big bone crunching bosses, and over 100 levels of challenging excitement. We just started this site up, so it's still missing a few pieces. Have a look around and keep stopping back by for more fun. SkullMonkeys.com is just another fantastical part the NeverHoOd. The first game we produced was also called The NeverhoOd, which is available for Windows 95.